Peter Nazareth’s powerful novel set in Africa. 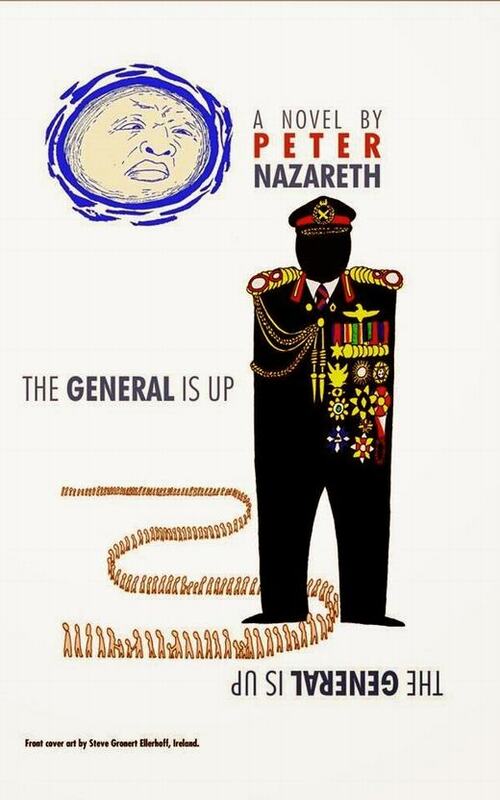 The General Is Up is a “novel set in modern Africa” by Peter Nazareth. Its story seems, at first glance, to be a fictionalised version of the expulsion of Asians from Idi Amin‘s Uganda in the 1970s. But its writer sees it as being something more than this. The author was associate professor in Iowa University‘s Department of English and the Afro-American Studies Programme, at the time of writing the novel, published by the Calcutta (Kolkata)-based Writer’s Workshop in 1984. Nazareth is a writer of Goan origin, and the novel is set, in large part, among the expat community of Goans, which has had a large number of out-migrants scattered across the globe, including, in the recent past, in Uganda, East Africa. The setting is “Damibia” set in “Africa. To be precise, Central Africa” (p. 21). There, the President-General of the country has just announced that “all the East Indians in the country have to leave by the next moon”. Says an author’s note to the book: “Any resemblance to real events, persons or countries is an unfortunate coincidence.” But not coincidentally, characters from the book have names such as Ronald D’Mello, Joe Pereira, David D’Costa, Horace D’Souza, among others, all names traditionally linked to the Catholic community from the region of Goa, which Nazareth traces his roots to, and which has been heavy into out-migration for generations. In its 30 chapters (besides an epilogue), the book focuses on “The General”, the Damibia Institute, guerilla attacks, portrayals of inter-racial equations in post-colonial East Africa, playing the game of tombola a students’ demo, a party, David’s departure from Africa, the sad farewell at the airport, and more. Nazareth has an interesting style of narration. When set amidst a real (though fictionalised) community, this adds to the readability. This novel was published by the Calcutta-based innovative publishing firm Writer’s Workshop, a small virtually one-man organisation that published the early creative writing from a number of persons who went on become prominent in their field. Writer’s Workshop printed its books “on an Indian-made hand-operated machine… on map-litho paper made in India”. Its books have been usually hand-bound with cotton handloom sari cloth woven in India, giving them a distinctive appearance. This book was published under its Greenbird series, focussing on fiction. When it came out in the mid-1980s, it was priced at Rs 80 (hardback) and Rs 60 for its paperback versions. It covers 190 pages, and has a brief but interesting three-page glossary that looks at terms in Swahili and Luganda (the languages of East Africa), apart from Konkani, the local language of Goa. Nazareth notes that in the ex-British colonies of East and Central Africa “almost all Goans are Roman Catholics and speak English as a first language, though some of them freely throw in Konkani words or expressions”. At the time of writing this book (mid-1980s), Uganda-born Nazareth who had an honours degree in English from Makerere University College and had done graduate work at Leeds University in England, had been a senior finance officer until he left Uganda in early 1973. He shifted to Yale University on the Seymour Lustman Fellowship. The author’s biography says this was “granted because of his novel, In Brown Mantle“. From Yale, he shifted to Iowa City as an honorary fellow of the International Writing Program and a visiting lecturer in the Afro-American Studies Programme. Incidentally, Nazareth’s work has been translated into a number of languages — including Hungarian, Polish, Japanese, Korean, Bengali, Hebrew, Arabic, Serbo-Croatian, Portuguese, and Konkani. Nazareth also teaches a widely publicized course on Elvis as Anthology at the University of Iowa. Apart from The General Is Up and In a Brown Mantle, Nazareth’s other publications include the work of literary criticism titled Literature and Society in Modern Africa that was later republished by the Northwestern University Press as An African View of Literature. Nazareth has also edited African Writing Today, a double-issue of the Pacific quarterly Moana and Goan Literature: A Modern Reader. The latter is, to date, one of the most impressive collections of Goan writing under one cover, in a range of languages and includes a great deal of writing from the otherwise under-noticed Goan diaspora. Goan Literature: A Modern Reader was published as an issue of the Journal of South Asian Literature. At the time of writing this work, three of Nazareth’s plays were broadcast by the British Broadcasting Corporation. The General Is Up was re-published by TSAR Publications, Toronto in 1991. Author Peter Nazareth in a message posted on the GoaResearchNet says he prefers this edition to the Writers’ Workshop one, and “it is slightly but significantly revised”. Nazareth disagrees with an earlier comment that the view that the novel is a “thinly-disguised fictionalised account of the expulsion of Asians from Idi Amin’s Uganda in the early seventies.” Instead, he sees it as being “largely about how to deconstruct the media, including words and therefore the novel itself since a novel is made out of words, to find out what is going on”.